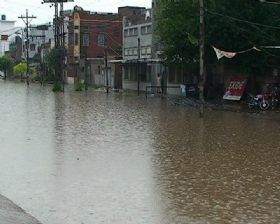 The city of Sialkot experienced the heaviest rainfall of the current year, it was also the highest rainfall across the country since the beginning of the monsoon season. The rain came in a time when whole country is going through the emerging conditions of drought. The rain was a sign of hope in the northern parts. Sialkot is located in the north-eastern part of Punjab province, the city experiences ‘very’ heavy rainfall during the monsoon season. The average rainfall falling in July and August are 288 mm and 259 mm respectively that is higher than the yearly rainfall of Karachi, south-western city of Sindh province. During the early hours of July 26 that is from 3:00 am PKT till 10:00 am PKT, almost 128 mm (5.0 inches) of rainfall occurred in just 7 hours. The highest temperature was recorded to be 36°C that fell to 22°C during the time of downpour while the humidity reached as high as 96%. Western disturbance ’15’ lied over the northern areas of the country during the morning as it absorbed monsoon moisture. A thundercloud formed SW of the city that gradually moved over Sialkot city in a NE direction. What was surprising to PWP was that it was small in size and not much developed. The rainfall was very isolated as Gujranwala received 47 mm rainfall that is SW of Sialkot. Even in Sialkot the rainfall varied, the area around airport recorded some 76 mm. The thundercloud dissipated completly once it neared the Indian border. Fourth monsoon is likely to continue till July 27 morning in various parts of northern areas including Lahore and Islamabad as thunder/lightning with rainfall may occur in these areas. 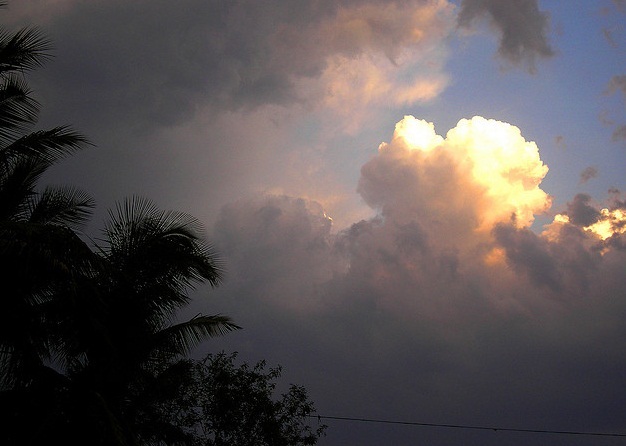 There are chances of hit or miss showers in Sialkot as a thundercloud could form nearby the city and such developments are frequent during the monsoon season. However it is unlikely that July 26’s rain would be repeated. Punjab has been witnessing hot weather and to make matters worse, the government has slapped the province with frequent power cuts that has become a common factor among the people of Sialkot. Keeping in mind that the city some how survived the otherwise devastating rain as there was no major flooding unlike in the past, which makes it a blessing for the city that was getting ready to fast in the Holy month of Ramadan! Very nice and informative ..
Thats what we like pwp extremly,, and we visit it many times during the day! I want to correct some thing for your kind information Sir,,, first of all the rainfall in sialkot on 26-7-2012 was lasted only for 1 hour and 45 minutes only….after that it was only thunder flashes …till 5.30 am sky was cleared with few patches of low lying clouds. Secondly as per my PWS (personal weather station) from 3.15 am to 4.20 am rain was scaled 172mm.. and as per my device supercell’s centre point was above our area during the peak cloud burst. However, 128mm is also correct as per PMD’s Sialkot cantt observatory, that is about 10 kilometres away from my location. Ok. But met office did said that rain lasted till the morning, also the satellite images indicated that thundercloud completly moved away from Sialkot after 10:40 am. However thanks for your data.